A matter of "neighborliness." That's how Democratic presidential aspirant Barack Obama justified raising taxes. Obama compared the circumstances of a person who is "sitting pretty" with that of a waitress. The waitress struggles, said Obama, while the rich can, and should, pay more. Nothing more, really, than a standard soak-the-rich plan, redistributing the wealth from the haves to the have-nots. But does Obama practice his own "neighborliness"? When Obama and his wife earned between $200,000 and $300,000 annually from 2000 through 2004, they donated less than 1 percent to charity. As a result of the sales from Obama's two books, he and Michelle earned as much as $4 million per year the past couple of years. Then the Obamas' charitable contributions went up to 5 percent. Let's turn to Iraq. Obama grudgingly concedes that the surge worked "beyond our wildest dreams." But he points out an "underlying problem." What "underlying problem"? Obama accuses the Iraqi government of failing to attain "political reconciliation," insisting that the government refuses to "take responsibility." Really? Of the 18 so-called Iraqi government benchmarks demanded by Congress, the Iraqi government has met or is close to meeting nearly all of them. Of the 18 provinces in Iraq, the Iraqi military and police now control 11 of them. Gen. David Petraeus, the region's commander, recently said that by next summer, he expects the Iraqis to take over control of Baghdad. In July, there were six American combat-related deaths, down from 66 last July. Let's turn to the economy and Bush's allegedly failed economic policies. Under President Bush, the economic pie grew. Tax receipts grew by 20 percent, to the highest level in our nation's history. And remember, Bush inherited an economy going into a recession. On Sept. 11, 2001, America suffered the worst attack on its soil in its history. Spending increased for Homeland Security and the war in Iraq. And of the current economic sluggishness, most can be attributed to the slump in housing. Does anybody, except for the most ardent Bush-hater, blame the President for the housing downturn? Following 9/11, polls showed that Americans overwhelmingly expected another attack within six months to a year. We have not had another attack on American soil in the seven years since 9/11. One of Obama's plans to "rescue" the American economy includes a "windfall" profits tax to punish oil companies for their "obscene profits." But the price of a barrel of oil fell from $147 per barrel in July to $101 today. Speaker Nancy Pelosi, D-Calif., assails the "oilmen" in the White House for rising oil prices. But the same "oilmen" remained in the White House during the more than 30 percent decline in prices. For what it's worth, the United States produces almost 7 percent of the world's crude oil supply. So somehow, someway, the greedy oilmen managed to push oil prices to worldwide historic levels, despite controlling only 7 percent of supply. So what does this all mean for the presidential race between Sens. Barack Obama and John McCain? Issue No. 1, for most voters, remains the economy. 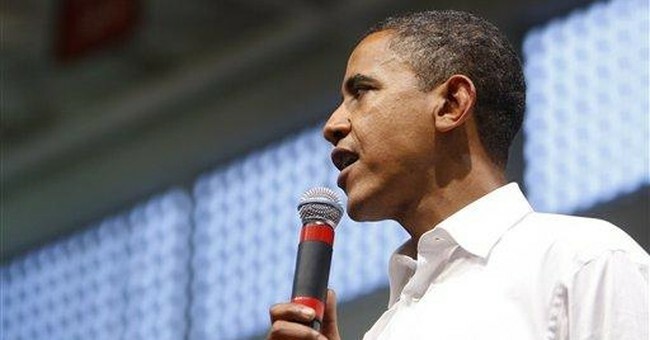 Obama recently said he may delay tax hikes in the event of continued economic sluggishness. Obama thus admits that higher taxes negatively affect the economy during hard times. But during good times, higher taxes affect the economy positively? And as to the war in Iraq, polls show Americans now confident of victory. Credit the "surge" -- an increase in forces and a change in tactics long championed by McCain. Obama not only opposed the surge but also predicted its failure. He was wrong, and McCain was right. Obama offers the George McGovern/Walter Mondale/Al Gore/John Kerry prescription of class warfare and class envy. It blames American "aggression" for its alleged loss of "respect" in the eyes of the world. The other side shows greater belief in free markets and free trade, and considers American success in Iraq a matter of national security. Democrats attack McCain and his image as a "maverick" by claiming that the Arizona senator voted with President Bush 90 percent of the time. But Sen. Barack "hope and change" Obama, in the past three years, voted with his party nearly 97 percent of the time. Americans, in the final analysis, want a strong economy and wish to live in safety and security. So the choice is simple. It's McCain.